LookLocalWA's Perth directory puts you in touch with Patios specialists near you. OUTDOOR living is deeply entrenched in Australian culture so it makes sense to create a backyard area that you and the family will want to spend time in. By installing a patio, pergola or gazebo outdoors, homeowners can stay safe from the sun’s harsh rays in summer and out of the rain in winter. With many patio varieties on the market, choosing the best option for your home can be an overwhelming process, but by enlisting the help of a LookLocal listed specialist, you will be taken care of from the beginning through to the end. From the free measure and quote, design stage, professional installation through to after care services and insurance repairs, a professional tradesman will be there every step of the way. Popular patio styles you may consider include pitched roof gables, flat, dome or curved roofs, sunroof patios, gazebos, carports or a pool enclosure. Built to withstand the elements, homeowners can opt for a Colorbond steel or timber framed structure, powder coating to ensure a highly durable finish, heat reflective polycarbonate sheeting and even seek help to install hardwood decking, lighting and blinds. The licensed builder will also ensure the project has the tick of approval from the shire and carried out using quality materials built to last. Transform your outdoor area in just a few short weeks by calling a local listed patio specialist today. AT PJ’s Patios & Fencing, there is a huge range of options available to help customers get the most out of their home and backyard. The business provides quality steel frame Colorbond patios, all custom built in any style including flat, dome and gable. It also offers fencing and pool fencing services. Owner-operator Paul has been in the trade for 15 years, giving him solid understanding of product range and practical expertise. Paul personally quotes for, designs and installs all patios, providing personalised service throughout the entire process. Understanding the investment involved in a new patio, PJ’s Patios & Fencing takes the time to identify clients’ individual needs and produce a result they are pleased with. Paul assures a high quality finish, working with professionalism at all times. The business caters to residential customers in Perth’s southern suburbs. Proud Supporters of Local Businesses. Tradesmen from start fo finish. We specialise in Patios Outdoor Blinds Timber Decking/Lining Sheds. THE family team behind Hunter’s Patios is an expert in adding that thoughtful and personal touch to a patio, which families can enjoy for years to come. The business is capable of building any style of patio, and specialises in Colorbond steel patios. Business owner and operator Jamie works closely with clients to ensure they receive a quality patio that adds value to their home. Jamie has spent 14 years in the in business and is passionate about providing quality workmanship. He works with his father Errol and wife Michelle to add a personal touch to your patio. Jamie has the expertise to custom build patios according to clients’ individual needs. “There’s nothing we can’t build,” Errol said. Hunter’s Patios uses 100 per cent Australian steel, primer on all brackets to prevent paint from flaking and buys local product whenever possible. All work comes with a 15 year structural guarantee and a one year workmanship guarantee. The business obtains building license and Water Corporation approvals. AT Northline Patios, a strong emphasis is placed on exceptional customer service, quality workmanship and value. The company uses quality materials from reputable suppliers, giving customers the peace of mind that they can enjoy their patio for years to come. Northline Patios can help improve the value of clients’ homes, increase privacy, protect homes from the elements and save on cooling costs. 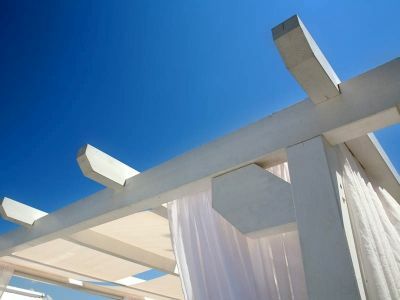 Available products include carports, patio blinds and gable, flat, dome and custom-made patios. The business also provides services such as shire approval, roof plumbing, re-guttering, repairs and electric work to patios. Business owner Phil Yozzi personally handles all work related to clients’ patios. This includes everything from quotes and shire approvals to construction. Phil understands patios are a significant investment for families, and therefore ensures he delivers first class workmanship for every job. He said the desire to make the process as transparent as possible was the difference between Northline Patios and other companies. “If anyone rings my number they talk to me—I don’t have any salespeople,” he said. The business assures customers won’t be made to feel pressured, with all quotes valid for 30 days. CREATE the patio of your dreams with the options available to you at Paramount Patios. The 16-year-old business has made a name for itself through the referrals of happy customers. Patios can come in any shape or size, including flat, dome, and pyramid. Choose from a range of high quality materials, with the option of gloss roofing for a sleek look. All patios are fully engineered and council-approved. Paramount Patios pays close attention to detail to ensure your patio provides elements of comfort and style to your backyard. Call John for a free measure and quote. Gables flats domes decking colorbond fencing and cedar lining.